You’ve seen our Centennial motto, Spread the Joy!, and now we have a song extolling just that! Musician, songwriter and longtime CDSS member Jonathan Jensen, of Baltimore, sent us this lovely gift which we’re debuting today, the 2nd day of Celebration Week. Listen to it and read the sheet music below. We hope you’ll sing it when you’re driving, grocery shopping, and walking. Sing it in the shower! Sing it at dances and festivals! Sing it with friends and family, and upload it to our Facebook page. Later this week we’ll be posting a video set to the song. 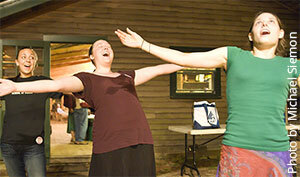 Spread the joy of dance, music and song—through song! Spread the Joy, A special song composed for the CDSS Centennial by Jonathan Jensen, featuring singers/musicians Greg Artzner, John Devine, Steve Hickman, Jonathan Jensen, Terry Leonino, Paul Oorts, DeLaura Padovan, and Maren Padovan. It's a slogan, it's a song! In the CDSS world, I'm most active playing piano for English country dance, contra dance and couple dancing, as well as writing tunes in all these genres. Lately, though, I've become increasingly busy writing songs ranging from goofy parodies like The Tea Chantey to rounds and serious ballads. So as the 100th anniversary of CDSS approached I had a mind to write some kind of tribute in words and music. It was hard to get a handle on this project until I noticed the slogan "Spread The Joy" on one of the organization's mailings. Once I decided on those three words as the title and the theme, the song all but wrote itself. 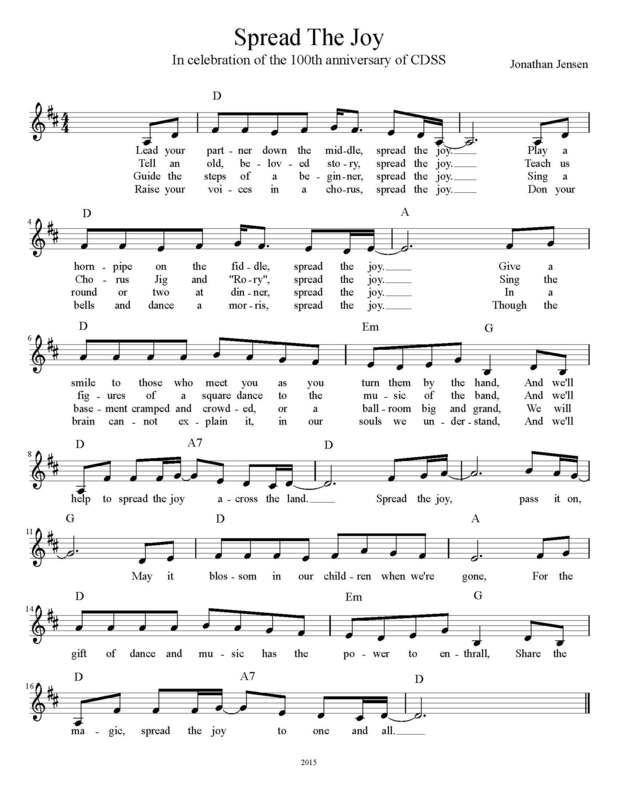 There are so many ways we all spread the joy of music, dance, story and song in our various communities that I probably could have come up with dozens of verses (although the requirements of rhyme and meter do impose certain limitations). On the evening of February 15 we all met at Charlie's studio in Takoma Park. After a few run-throughs we worked out an arrangement that suited all the voices and made a number of takes, with me handling string bass duties. None of our readings were perfect all the way through, but we got to see Charlie work his wizardry as he swiftly replaced a faulty note or phrase from one take with a better version from another. We look forward to sharing the song with our friends across the nation as we join in celebrating the first 100 years of the Country Dance and Song Society. CDSS is delighted to have our own song for our Centennial—we look forward to singing it with friends and humming it as we work. Thank you, Jonathan, and thanks to Charlie, Terry, Greg, Steve, John, Paul, Maren and DeLaura for singing along, and thanks as well to Mary Wesley for her video set to the song.